July | 2015 | Abez sez Assalamualaikum! So it’s crunch time. The house is being packed and sorted into a bazillion little piles, all bound in invisible string and tied directly to my heart. Every time a little pile- Khalid’s first artworks, Iman’s first story, Musfira’s baby blanket- fails to make the packing priority list, it stings as it’s tugged and let loose. Every thing sold has a history, good or bad. Some strings were tied too tightly, and feeling them snap and fall away feels like being able to breathe again. Things I’ve wanted to burn are instead given away, things I wanted to keep forever in my hands will be left behind and then kept in my heart instead. Growing up with a Mormon mother, I was taught to document, treasure, and save all these little piles of things and cherish them from one international move to another. I have carried with me a drawing my little brother made me in 1994 as well as the first tooth that I lost since I first lost it. But growing into a Muslim, I have come to understand that this frantic need to preserve every last scribble is futile for three reasons. First of all, Allah has sent angels to record every word, thought, and moment in my life with nothing less than Divinely powered accuracy. They’re doing a much better job of recording my life than I ever could. Second, I can’t take it with me. Nothing will go with me into my grave except for my good deeds. Not even the doll my mother bought me when I was four. That would be exceptionally creepy. Third, Allah will take the universe- the entire vast and incomprehensibly big universe- into His right hand and roll it up like a scroll. It’ll be done. Khallas. Finished. Destroyed. Why do I need to preserve what the angels have documented and what Qadr will destroy? Why do I need to preserve that which was intended to be temporary? I don’t. So I’m not. The only exception to this is my poetry, and now that every dresser and drawer is being dumped out and aggressively sorted, random poems are coming out of the woodwork. So I may be posted random poetry here and there as I find it. And once it’s been typed, I will be throwing it in the garbage. So my brilliant writerly friends (who let me hang out with them sometimes) play a game in which we take two books, pick a sentence from each at random, and then attempt to connect the two in some semblance of sense. It is a tremendously challenging exercise as a writer, all the more so when the skills-bar is raised so high. We don’t know what it’s called, so I’m calling it an Elegant Mashup. This week, we mashed Bernard Cornwell’s Sword Song, a historical fiction set in 9th and 10th century Britain- together with two Islamic books, Lost Islamic History and The Prophet’s Methods for Correcting Peoples Mistakes. But as Islam fell in this western outpost, it was just starting to be revived in the East, where the Ottomans would reintroduce Islam to Europe and preside over a new golden age. They would enter by invitation- as the locals knew long beforehand of their character, their honesty, and the desperately needed goods they brought. They were experienced merchants as well as men who feared their foreign God, even if they seemed to have no respect for ours. At first, the Druids went nearly rabid trying to convince the townsmen to expel them, crying omens of darkness and the inevitable doom that the Turks would bring. We believed them, the same way we believed that tea leaves spoke truth and stars spoke for the dead, but our town was hungry. Our trade was dying. Our marketplace was empty, so we welcomed the Turks. Gods, our gods, fell strangely silent when they came. The omens ceased and the ranting quieted, maybe because gods like a full belly and a pinch of salt too. Even gods need to eat I suppose. But not all of the Turks feared their God, or our gods, or any God it seemed. One day a group of the Ottomans took up the very arms they had come to sell us, and blood was spilled on the newly cobbled road of the marketplace. They fought one of our clansmen and took his home. They slew his sons, and from his daughters, they took liberties. The rest of the merchants- the Ottoman strangers, took to arms up too- but against the rogue merchants. We stood with them, shoulder to shoulder, sword to sword and shield to shield, outside of the captured longhouse. I stood there too, with fire in my stomach and fear in my heart. Because Aethelflaed, sweet Aethelflaed, to whom I had made an oath, was a captive. “How else can they send a messenger to the dead?” Ethelwold asked. His palms were damp but he could hide them. Just as he could hide the knots in his stomach. Ethelwold was almost sure Jason couldn’t see the panic inside him. Almost. Ethelwold’s stomach contracted in fear. He had brought them food yesterday, bread tied flat against his belly and chest. He had chosen the darkest part of the night, and they had been too weak to be overjoyed. But they had whispered their thanks. In a moment of blinding certainty, Ethelwold had pulled the scarf away from his face. Who had he to fear? Only Allah. Now, standing across from Jason, he struggled to remember who his real Lord was. Hadn’t he, a few weeks ago, snuck across the valley and stood watching them? “I’m part of you,” he had wanted to say. But he’d held his tongue, making himself content with what his heart felt.It was actually the finest spectacle ever witnessed of Muslims leaving their homes, praying, acclaiming Allah’s Name. I turned to my men. Hungry and bare, hair matted and bared, their eyes glittered. I counted their faces. Still twenty remained. Of them, how many could be counted on to hold a sword, to wield a knife? Yusuf, Moiz, Qamar… perhaps ten. Maybe fifteen of them whose limbs now crowded the ship’s stern would stay their ground in a fight. Not enough to take the garrison, not if we went straight in. But if we split into two, and half the mean went in from above while half set fire to the ships? My mind was made up. With all deference to the Ustadh, we would stake our claim. Because it was time to fight. In the darkness I shifted carefully, so that the sound of my armor would not betray our presence to the guards. I found Iskandar’s eyes, in the half shadow beneath his visor staring vacantly at the wall itself. There, hanging no more than a cubit’s height from the ground, hung a man. Rather, it used to be a man. Now it man-shaped collection of desiccated flesh, clinging to bone bleached from the sun and sinews putrid from its heat. In the gentle pre-dawn breeze, it creaked slowly back and forth on the rope that suspended it. How strange, I thought, that they should have hung him in his armor. Armor was precious, and the Turkish craftsmanship was so far superior to our poor saxon vests that our bandits wore their pilfered armor without any modifications at all. If they left this man’s armor on, it was because they wanted it seen. The wind rose, and the body turned to face us. Even without eyes, his face was still recognizable. No other man had inspired so much respect in the village, or commanded so much admiration in its people. It was Saeed. Saeed Abu Iskandar As-Saleh. Turning slowly in the breeze. Iskandar roared, and the very air trembled with his fury. I remember, very clearly, the thin metallic scrape of his sword being pulled from its sheath. 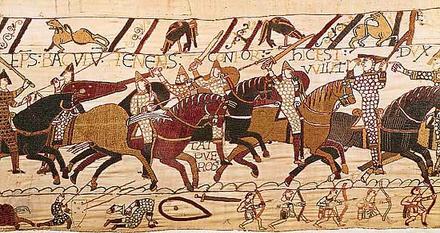 He leapt onto the low wall itself and began clawing his way up to the Saxon guards who stood dumbstruck at its top. The ignorant person needs to be taught, the one who has doubts needs to have things explained to him, the negligent one needs to be reminded. The one who willfully persists in error needs to be warned.